The most Versatile, User-Friendly Fiberglass and Asphalt Shingle Cutter Available! Shingle Shear makes cutting all types of fiberglass and asphalt shingles fast, easy, and accurate. The slide-in-scale makes the Shingle Shear easy to transport and store. 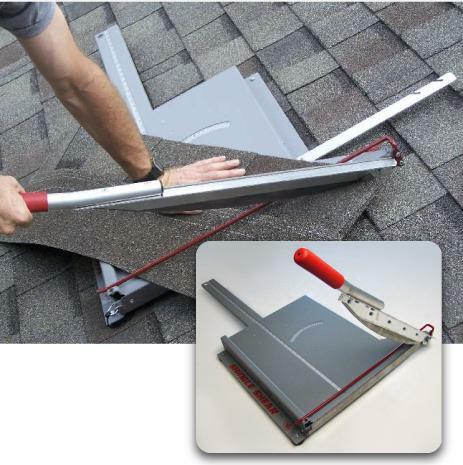 Durable aluminum construction makes Shingle Shear very lightweight and easy to handle. Blades are easily sharpened and low-cost replacement blades are available. The Shingle Shear is available at Suppliers throughout the US and Canada. Find a distributor now. The Shingle Shear Kit is available to order direct from our online store. The Shingle Shear Kit offers all the same functionality of the Original Shingle Shear in a kit that you can assemble yourself. It is a great Low-Cost solution for the Do-It-Yourselfer. Order yours direct from our online store.